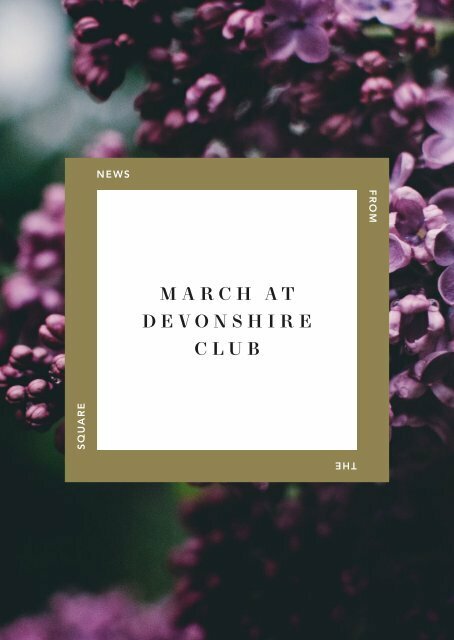 Dear Member, M is for March, Mother’s Day, Palma Michel and even Miss Moneypenny… It is going to be a marvellous month in the Club, and we cannot wait for you to join us. We have another incredible woman speaking for us in our Dangerous Girls season: explorer Rosie Stancer has been to the poles and back and will share her extraordinary adventures with members on the 15th. When it comes to celebrating Mother’s Day, we have some beautiful specials for brunch and a luxurious afternoon tea to enjoy, whilst a harpist plays some harmonious music to fully unwind... Rugby fans are also in luck as we will be screening the 6 Nations Rugby from the 11th to 17th March within the Club’s Library Bar. Meanwhile, fashion fans are invited to a special shopping event hot off the Paris Fashion Week catwalks. Finally, if you need a dose of calm, our favourite life coach, Palma Michel, has hand-picked a selection of TED-style speakers to feed your mind, body and spirit and set you up for the year ahead. We look forward to seeing you in another entertaining and enriching month in the Club.